On Thursday, February 28, the Asper Centre hosted Professor Y. Y. Brandon Chen for a Constitutional Roundtable titled “Toward a Substantive Understanding of Citizenship in the Canadian Charter of Rights and Freedoms”. Chen is a lawyer and social worker by training, and is completing his SJD at UTLaw. He is currently an Assistant Professor at the University of Ottawa’s Faculty of Law, focusing his research on public law, health, and migration. Chen was also an Asper Centre clinic student in 2009 while a pursuing his JD at UTLaw. 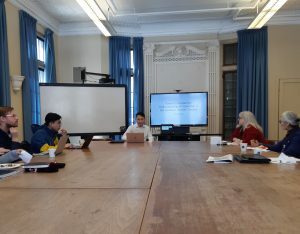 For the Roundtable, Professor Chen presented an argument for a more inclusive judicial definition of Canadian citizenship within the Charter. The first part of his presentation focused on the three sections of the Charter that explicitly limit rights to citizenship – sections 3, 6, and 23. He argues that courts have relied on Federal statutes’ definitions of citizenship to inform their understandings of citizenship, resulting in a large number of people being inadequately protected. Chen’s stance is that Courts should be reading these sections of the Charter in a more purposive manner in an attempt to include non-citizen groups who are also entitled to the same degree of protection. Chen posed two questions in relation to s.3, s.6 and s.23. Firstly, should the meaning of “citizen of Canada” depend on legislative definition? If so, are we allowing Parliament to skirt its Charter obligations? Secondly, he asks what a judicially constructed definition of citizenship would look like. Chen proposed that citizenship can be understood as membership in a state. More specifically, it is the desire to foster a deep connection to a society. This idea is supported by social science research and the Supreme Court in the case of Ontario v Winner  SCR 887. However, the present legislative definition of citizenship is not broad enough to encompass all groups of people who possess these qualities. There are non-citizens with similar interests and relationships to the Canadian state that are entitled to the protection of the Canadian government under this definition. The second part of Chen’s legal argument was focused on how s.15 of the Charter interprets citizenship as an analogous ground of protection. Currently, the court only targets policies that draw a clear line between citizenship and non-citizenship. For example, in Toussaint v Canada (Minister of Citizenship and Immigration), 2011 CAF 208, the Federal Court of Appeal rejected a claim that a law discriminated against non-citizens simply because other non-citizen groups are protected by the law. This is a simplistic line of argument that tends to erase the distinct groups that exist under the non-citizen category, such as migrant workers, international students, and permanent residents. Despite their universal non-citizen legal status, these groups receive differential rights from the government. Chen emphasized that Canadian courts have ruled that discrimination based on one type of disability is still disability discrimination, even if other types of disabilities are protected. In recognizing that there are different non-citizen groups who receive differential treatment, the same logic should be applied to them. Overall, Professor Chen presented a compelling argument for the courts to understand citizenship in a way that more actively protects individuals’ rights. In questioning the courts’ reliance on Parliament’s definition of citizenship, he opened up the possibility of protecting more individuals under the Charter who are already substantive members of Canadian society. Furthermore, in challenging the normative line between citizenship and non-citizenship under s.15, Professor Chen advocates for a more nuanced and complex understanding of differential (non)citizenship experiences. Michelle Huang and Jeffrey Wang are 1L JD Candidates at the Faculty of Law. They are also members of the Asper Centre Immigration & Refugee Law student working group this year. This entry was posted in Asper Centre students, Commentary and tagged Charter Rights, Citizenship, Immigration. Bookmark the permalink.